Harry Caray: "Hey! We're talking to Michael Jordan, former basketball king of Chicago. Michael, tell me, that's a heck of a turtleneck you've got on. Where did you get it?" Michael Jordan: "Uh, well, the team just provided it for me ..."
HC: "How about that! An authentic Cubs turtleneck! Michael, how do you feel about the Cubs' chances this year?" 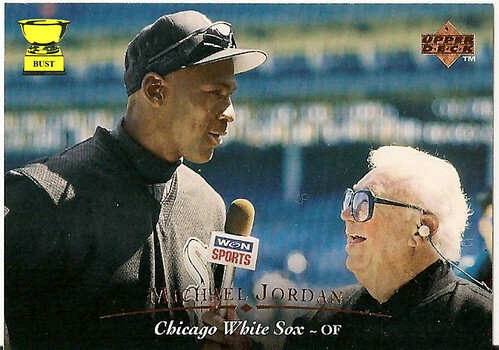 MJ: "Harry, I'm playing for the White Sox. Come on, we went over this." HC: "Ha! Well, that would explain why I'm wearing all this black. And here I thought I was at President Truman's funeral!" MJ: "But Truman's been dead for years ..."
HC: "Hey, Michael! What's the most hot dogs you've eaten in a single sitting? I once ate 14, myself. I was so sick that night, I slept on the bathroom floor in a woman's robe. That's why my friends call me Frankfurter." HC: "Well, that's all the time we have for today. Tune in next week when I'll challenge Frank Thomas to a bout of Greco-Roman wrestling. Cubs win! Cubs win!"